The Rules of Keeping One’s Home Clean • Chicago Maid Co. When the question of how it is best to manage your home arises, opinions vary greatly. Everyone is going to tell you a different strategy or set of rules that are to be followed. On one thing however, we can all agree – keeping your home clean and never making compromises with the level of hygiene there is of a paramount importance. So, what are the ways to do that? Keep it regular. Cleaning is something that you should do every day, because otherwise it becomes harder and harder to tackle. Do not leave Sunday to be your only sanitation day of the week, because thus you will be making yourself a huge disfavor. Break down the work into manageable chunks. When we say that you need to clean every day, we do not mean the entire house. You can do the laundry when you get back from work on Monday, scrub the toilet on Tuesday, vacuum all carpets thoroughly in the weekend etc. Dividing the chores into small chunks and then handling them one by one is a great way to both have a completely clean home and getting a sense of accomplishment. If you feel like you do not have the time, energy or the skills to handle your home cleaning on your own, do not just abandon the cause. 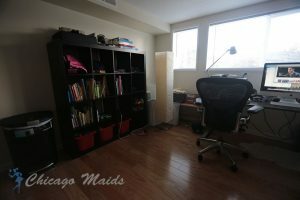 Hire a maid service, such as the one offered by Chicago Maids. They will do the job for you, provide you with a healthy environment to live in and would not charge you so much that you feel your budget strained. At the end of the day, it is the best deal you can come across. Whenever it is possible, go for the green solutions. Chemical cleaning products are the worst thing you can do both to yours and your family’s health and the environment. Fortunately, there are many eco-friendly detergents available on the market today that you can choose from. Alternatively, many people opt for preparing their home cleaning solutions on the own, as DIY jobs. You will be surprised how much one can accomplish with baking soda, white vinegar, salt, water and a regular dishwashing liquid. Check out recipes for homemade cleaning products online and you will see. Do not try to be a hero and handle all the work on your own. Delegate some of the responsibilities to your family members. Getting your kids and partner involved is going to strengthen the family bond, help you finish with the chores faster and would teach everyone several very important lessons about independence. Cleaning might be taunting and exhausting, but in the end of the day, it is the most direct and successful way to improve your quality of life.